Habit: Annual to shrub. Leaf: generally simple, generally alternate, generally petioled; stipules 0; blade entire to deeply lobed. Inflorescence: various. Flower: bisexual; calyx lobes generally 5; corolla +- radial, cylindric to rotate, lobes generally 5; stamens 5, on corolla tube, alternate lobes; ovary superior, generally 2-chambered, style 1. Fruit: berry, loculicidal or septicidal capsule, [(drupe)], 2--5-chambered. Genera In Family: 75 genera, 3000 species: worldwide, especially +- tropics; many alien weeds in California; many cultivated for food, drugs, or ornamental (potato, tomato, peppers, tobacco, petunia). Toxicity: many TOXIC. Note: Nicandra physalodes (L.) Gaertn. is a waif. Habit: Annual to shrub, vine or not, prickly or not, often glandular. Leaf: alternate to +- opposite, often unequal, entire to deeply pinnately lobed. Inflorescence: panicle or umbel-like, often 1-sided. Flower: calyx +- bell-shaped; corolla +- rotate, white to purple (yellow), lobes generally of different color toward base of midrib, generally without spots at base; anthers free, > filaments, oblong or tapered, opening by 2 pores or short slits near tip, in age often splitting to base; ovary 2-chambered, style 1, generally +- straight, stigma head-like. Fruit: berry, generally spheric, fleshy (or dry, capsule-like). Seed: many, compressed, generally reniform. Species In Genus: +- 1500 species: worldwide, especially tropical America. Etymology: (Latin: quieting, from narcotic properties) Toxicity: many TOXIC. Note: Many cultivated for food (including potato, Solanum tuberosum), ornamental; Solanum dimidiatum in California an urban weed. See Lycopersicon for other taxa recently included here. Habit: Perennial herb < 10 dm, from rhizome, forming colonies, generally prickly, stellate hairs dense, scale-like, rays fused at base. Leaf: 2--15 cm, oblong, entire to +- lobed, +- yellow. Inflorescence: raceme-like. Flower: calyx 5--8 mm, lobes +- = tube; corolla 20--30 mm wide, purple or blue; anthers 8--10 mm, +- equal. Fruit: 8--15 mm, orange, often persistent. Seed: 2.5--3 mm. Chromosomes: n=12. 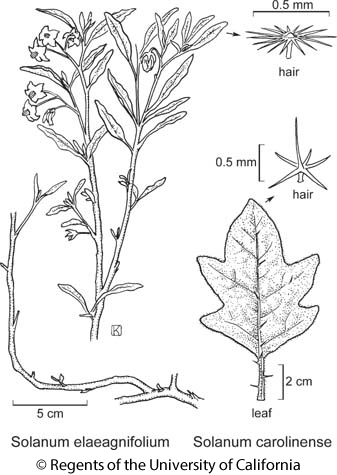 Citation for this treatment: Michael H. Nee 2012, Solanum elaeagnifolium, in Jepson Flora Project (eds.) Jepson eFlora, http://ucjeps.berkeley.edu/eflora/eflora_display.php?tid=44852, accessed on April 20, 2019. CA (exc NCo, KR, GB); Markers link to CCH specimen records. Yellow markers indicate records that may provide evidence for eFlora range revision or may have georeferencing or identification issues. Purple markers indicate specimens collected from a garden, greenhouse, or other non-wild location.